I have a confession to make. I hate reading research papers. I'd love to blame this on the fact I'm dyslexic. But --since I read half of 'Game of Thrones' yesterday on my kindle-- I can't honestly say that really holds me back. It's not even that I don't want the information contained within their double-columned depths; I just find the majority of them turgid, somnical toilet roles. I'm pretty sure this makes me a terrible astrophysicist. However, today I was out of excuses. I had a paper that was so overdue for publication, it could have predated Brian May's thesis. The introduction had to be drafted and for that, I had to find out what everyone else in my field had been doing while I was failing to form a world famous rock band. 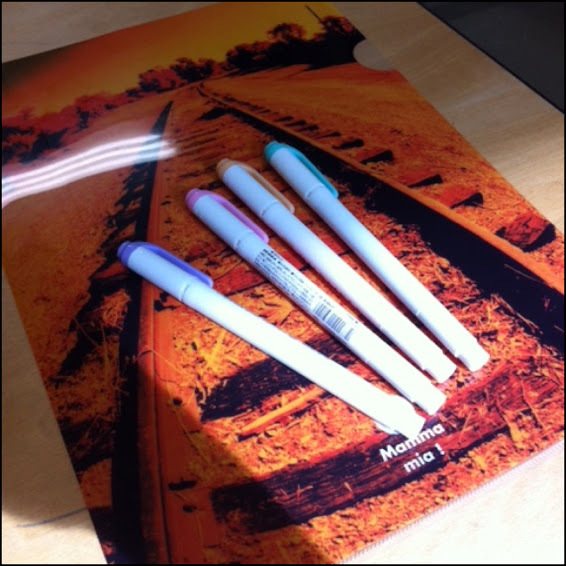 Unfortunately, I had the insurmountable problem of not possessing the right coloured highlighters with which to probably annotate the papers. Clearly, they needed to be purchased before any progress could be made and --since I wanted to be sure of a suitable selection-- the store to go to was the one on the other side of campus. If only I had remembered while I was eating lunch in the canteen next door. So sad. Admit it. You're impressed with my ability to avoid work. The highlighters in the shop were easy to locate and --in true Japan style-- they had every single shade imaginable to choose from. The difficulty of the selection was being proved by the elderly couple standing directly in front of the shelf trying every single pen. I have no idea what they were avoiding doing, but man! It must have been bad. Even the woman behind the cashier was hiding smiles as the couple kept turning away, selection in hand, only to change their minds and continue to block the display. I filled in the time by selecting a clear file. Frankly, I don't really understand clear files. They are plastic wallets but are too thin to take more than a few sheets of paper. For incomprehensible reasons, they are immensely popular in Japan and are sold in all different colours and designs. Finally, the elderly couple departed and I was able to pick up my highlighters. I tried to dawdle and convince myself that the EXACT SHADE OF BLUE was desperately important but … it just wasn't and I knew that. I was finally out of excuses. I returned to my office and promptly wrote half the introduction. Then I stored the papers I had printed out in the clear file. It already felt overfull. I looked down at the design I had chosen; it had a picture of a train track on it. Where is that track going? TO PAPER PUBLICATION LAND. If you use Mac Preview to highlight your papers, you get the choice of 16 million colors. Not that I ever use anything besides yellow, orange, and some sort of pastel blue. I have tried and tried to read papers on my laptop and ipad but with little success. I just find the back-lit screen too difficult. I use iAnnotate on my iPad which does everything I need... but ultimately, I've only been able to use it for reference. Diary of a 30-something British astrophysicist who has recently moved to Japan with her cat, the latter of which is engaged in the slow punishment of taking over the bed during each and every night. Largely, I write so that when stupid things happen I can think: "... at least that will make a good blog post." You live and learn. At any rate, you live.